Progeno is a Ghent University spin-off company that aims to empower professional plant and animal breeders by giving them direct access to the state-of-the-art in breeding and selection methods by means of a user-friendly and industry-proven software system. Progeno software warrants a more cost-effective breeding programme as well as faster genetic progress. 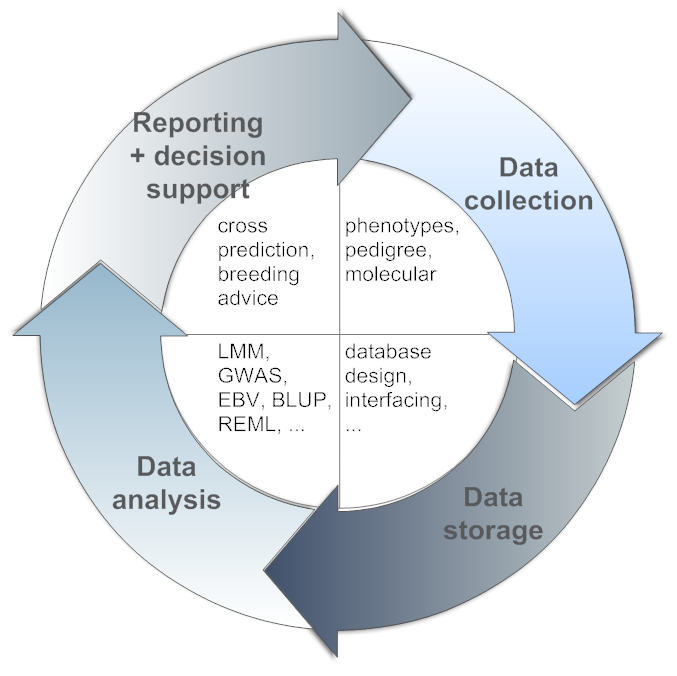 Progeno assists breeding companies in all aspects of the iterative “breeding data life cycle” which generally includes data collection, storage, analysis and decision making phases. We develop custom experimental trial designs for the collection of phenotypic observations such that maximal discriminating power is obtained within the imposed time and budgetary constraints. In a similar reasoning, genomic studies also need careful preparation as the number and position of the scored molecular markers greatly determines the precision and usefulness of subsequent data analysis steps such as a genomewide association study or the construction of a genomic prediction model. Progeno assists breeding companies at maximizing their genotypic information gain whilst minimizing the total molecular price tag by identifying (nearly) redundant or uninformative markers and taking advantage of powerful imputation techniques. Consistent storage of both phenotypic and genotypic observations is the key to long-term success of any breeding program. However, implementing or upgrading a data storage infrastructure can be a daunting task considering the amount and diversity of information that is generated by breeders and biotechnologists. We have extended experience in this field and commit ourselves to safeguard all breeding data integrity whilst maintaining sufficient flexibility to allow for future modifications and add-ons. Technology-wise, we make use of industry standard relational database systems including Oracle, MS-SQL Server, MySQL and PostgreSQL as well as the NoSQL MongoDB database system. Data analysis and representation is perhaps the most crucial step in the iterative breeding data life cycle. The Progeno computing engine is a highly sophisticated software package that was specifically developed for analyzing industry-sized breeding data. We offer data analysis as a service, giving breeders direct access to pedigree-based and/or genomic breeding values, cross predictions and accurate breeding advice by means of the web-based user-interface of the Progeno software framework. We provide custom software solutions to breeding companies including the implementation of newly developed or existing algorithms, often requiring a considerable mathematical or statistical background. We are specialized in parallelizing computationally demanding algorithms or codes, allowing them to take advantage of multi-core processors and computer clusters. We also offer software solutions to visualize phenotypic and genotypic observations. Last but not least, we develop custom tools to analyze, streamline and secure data and information flows within your company.